Kids love to jump, scream, shout and play on our huge inflatables at the Sports Connection's indoor Jump-N-Play zone! You provide the kids. We'll provide the fun! All participants must bring a signed Sports Connection waiver with them to the party. Waivers are included with the Sports Connection invitations. 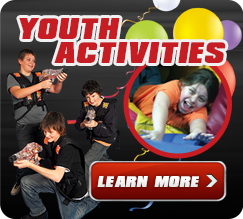 Other parties or people may be in Jump-N-Play at the same time as your party.